Wholesale Medium Weight Yogurt Spoons Colorful Spoons for Frozen Yogurt. New Medium Weight Colored Yogurt Spoons! These colored spoons are perfect for frozen yogurt, ice cream and almost anything. Medium weight yogurt spoons is a colorful economical option for frozen yogurt and ice cream shop owners. 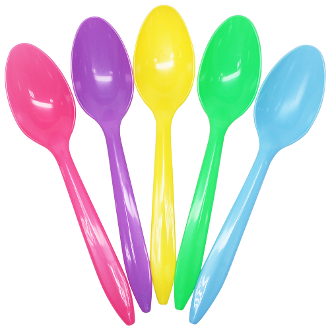 These yogurt spoons are sold as mixed colors (Rainbow: Green, Pink, Blue, Yellow, Purple) and individual colors.